As summer approaches and the temperature rises, the presence of air pollutants and the health concerns associated with those pollutants increase as well. You can protect your health with an understanding of the Air Quality Forecast. The Environmental Protection Agency (EPA) calculates the Air Quality Forecast daily in accordance with the Clean Air Act. The forecast provides several pieces of information. • A range of air quality values, or the Air Quality Index (AQI). The AQI ranges from 0 to 500, with 0 indicating the healthiest air quality and 500 indicating the unhealthiest air quality. The Air Quality Forecast covers six common air pollutants: ground level ozone, particle pollution, carbon monoxide, sulfur dioxide, nitrogen dioxide and lead. Ground level ozone forms when pollutants from vehicles, industrial activities, volatile organic compounds and other sources combine in the heat. Ozone levels peak in the hours between the early afternoon and the early evening during the summer. Particle pollution is a combination of small solids and liquids suspended in the air. Particle pollution can peak at any time. Carbon monoxide, sulfur dioxide and nitrogen dioxide are all harmful gases. Lead is a heavy metal that can be emitted into the atmosphere most often through dust and fuel vapors. These pollutants are the primary components of the environmental phenomena known as smog and acid rain. The pollutants present in unhealthy air can cause or worsen respiratory issues such as asthma, allergies, eye irritation, skin irritation and even cardiovascular concerns. They can also degrade the immune system and cause vulnerability to infection. The demographic groups who are most susceptible to the negative impacts of polluted air include children, active individuals, elderly adults and individuals with heart or lung conditions. Children breathe at a higher respiratory rate than adults, so they are more prone to ingest pollutants. Furthermore, their developing lungs are more sensitive to the effects of these pollutants. Active individuals often participate in activities that require physical exertion, so they are also more prone to ingest air pollutants as a result of their higher respiratory rates. Older adults have less resistance to ambient air pollutants, and they are more vulnerable to heart and lung conditions. Individuals with heart conditions such as coronary artery disease and congestive heart failure or lung conditions such as asthma and emphysema often have weakened immune systems and respiratory issues that can be exacerbated by polluted air. Depending on the levels of pollutants in the air, the Air Quality Forecast also recommends actions for sustaining health. These recommendations range from no action on days when the air quality is healthy to a complete avoidance of all physical exertion on days when the air quality is unhealthy. WHAT COLOR IS YOUR AIR? The Air Quality Forecast is color coded. Code Green indicates air quality in the range of 0 to 50 on the AQI, or air that is healthy. All demographic groups can participate in their normal activities, as air quality forecasters do not anticipate an increase in health concerns caused by air pollution. Code Yellow indicates air quality in the range of 51 to 100 on the AQI, or air that is moderately healthy. Unusually sensitive individuals may experience the effects of air quality at this level and should consider limiting prolonged exposure or exertion. Code Orange indicates air quality in the range of 101 to 150 on the AQI, or air that is unhealthy for sensitive groups. Children, active individuals, elderly adults and individuals with heart or lung conditions should limit prolonged exposure or exertion. Code Red indicates air quality in the range of 151 to 200 on the AQI, or air that is unhealthy for all groups. Children, active individuals, elderly adults and individuals with heart or lung conditions should avoid exposure or exertion. All other groups should limit prolonged exposure or exertion. 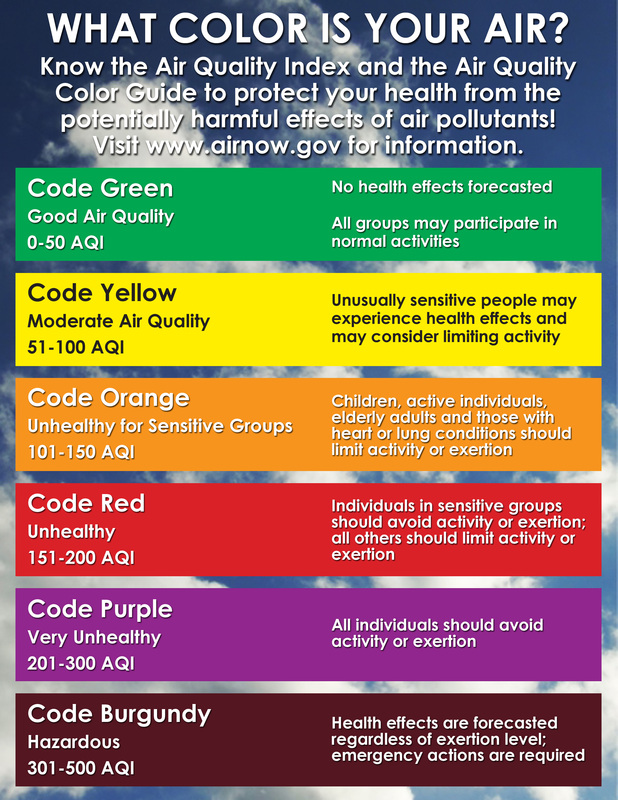 Code Purple indicates air quality in the range of 201 to 300 on the AQI, or air that is very unhealthy for all groups. All individuals should avoid exposure and exertion until Code Purple conditions are lifted. Code Burgundy indicates air quality in the range of 300 to 501 on the AQI, or air that is hazardous. If air quality is in this range, the entire population may experience adverse effects from air pollutants regardless of exposure level. Code Burgundy conditions require emergency action. The Internet resource AIRNow is a partnership between the EPA, the National Oceanic and Atmospheric Administration, the National Parks Service and variety of agencies at federal, state, regional and local levels. The site provides air quality forecasts for over 300 major United States cities and maps indicating air quality conditions throughout the nation. The AIRNow mobile app for your Android or iPhone provides location specific reports on air quality information as well as forecasts for both ozone and particle pollution. The Division of Air Quality of the North Carolina Department of Environment and Natural Resources provides air quality forecasts and information specific to the state. To contact the Fort Bragg Air Quality Program Manager, please call Gary Cullen at 432.8464.